The perfect chocolate mousse needs only three things; high quality cooking chocolate, eggs and plenty of air. 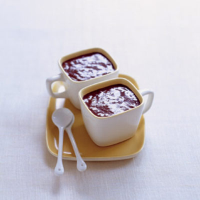 In catering schools, mousse is considered a test of the cook's deftness. The secret is in the folding technique. Place the chocolate in a heatproof bowl over a pan of barely simmering water and leave it to melt. Once half melted, take off the heat and beat until the last chunks liquefy. Set aside to cool so it is lukewarm but still fluid. Meanwhile in a large mixing bowl, beat the egg whites with an electric or hand whisk until they form stiff peaks. In a separate bowl, beat the yolks and add the melted chocolate. Fold in 1/3 of the egg whites. Then tip in the rest of the whites and fold in until no pockets remain. The lighter you are with your folding, the lighter the mousse. Use a large metal spoon to lift the chocolate up through the whites, distributing it evenly with a flick of the wrist. Divide into 4 ramekins and chill in the fridge for 1 hour.